Your work seems to strike a balance between armor/shells/protection and vulnerability. Is that a fair assessment? Is that something calculated, if so, what inspires it, and to what effect? A lot of my work from the past two years deals with the concept of armoring and self-preservation. I have always been interested in European medieval history and was especially interested in the ornate craftsmanship of different armor. This led me to considering the physiological need for protecting oneself. We all have elements of our mental, emotional, or spiritual self we feel the desire to protect. 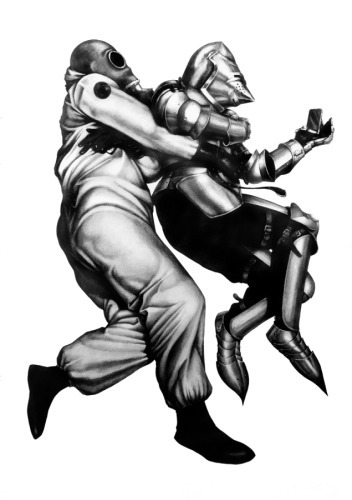 The armored knight became a perfect metaphor for discussing these acts of self-preservation. 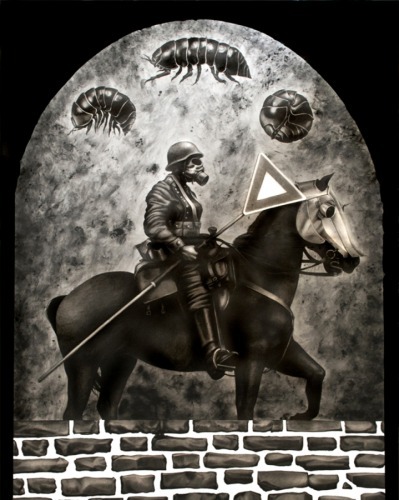 This theme of varying levels of defense was the subject of my solo show at the Bolsky Gallery in Los Angeles in 2014, titled In Defense. I’ve decided that one of the five questions will always be from the Proust Questionnaire, and here is yours…If not yourself, who would you be? I’m always trying to be a better me, pushing the envelope and expanding my horizons. If I wasn’t me, I would want to be a better me – to find a more honest truth that lies beyond. But, beyond what, I have no idea. I love your illuminations. Actual books on paper are on the way out, I fear, and it’s nice to see them treated with such reverence. How did you achieve the effect? How did you choose the books/words to illuminate? The illuminated series was something I did during my time as Artist-in-Residence at Shankill Castle in Paulstown, Ireland. I spent time there studying the techniques used to create illuminated manuscripts. The word “Illuminate” is Latin, meaning both “to set ablaze” and “knowledge.” With this in mind, I began researching which author’s books were burned by the Nazi’s in 1933, and decided that these books perfectly encapsulated both definitions of the term “Illuminate.” I chose titles by authors that roughly stated what was happening in the world at that time (A Farewell to Arms, Communist Manifesto, War of the Worlds, etc.) And by turning these books into illuminated pages and ornate reliquaries, it exalts their extreme act of censorship to a form of martyrdom. 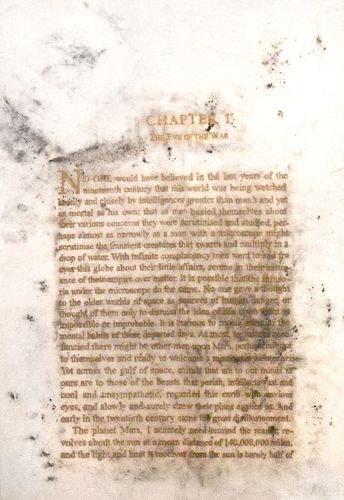 I re-rendered the first pages of several books using a technique originally used by Catholic monks during the middle ages. And, I used charcoal and gold leaf to create these pieces – feeling that these mediums were a perfect summation of the conceptual reasoning behind the work. I also love the knights, I’ve always been fascinated by armor—so much artistry poured into something designed for war and death. Can you explain the story/meaning behind some of the more cryptic images? Pilgrims, the Fetal Knights, Two Spoons? 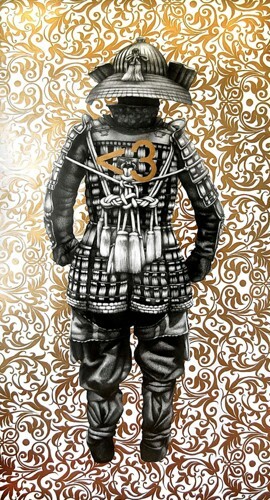 The armor serves as a visual metaphor for the act of self-preservation. The more you armor yourself, the more protected you are, but you are simultaneously confined by boundaries you have designed for yourself. You see this in the piece “Fetal Knights 1 & 2” -- to be so encased and protected due fear of getting hurt your are left in a fetal position. In the case of “Two Spoons,” I illustrate the act of being close with someone, without actually being intimate--a feeling I believe many people are accepting as common place with such outlets as social media and smart phones to feign a digital intimacy instead of actual intimacy. 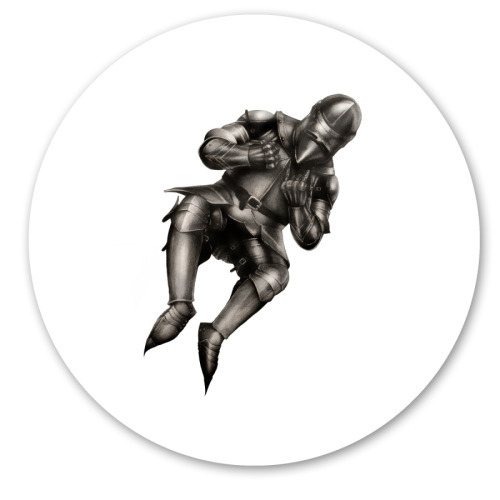 We do this because there is a greater chance of being hurt with actual intimacy, making digital platforms a new way to armor ourselves (If you look closely with this piece, you can even see the knight gripping an iphone). But, this is a futile effort. There will always be something that will hurt you, some little thing that will weave its way through your defenses and touch you where you are most vulnerable. The piece “Pilgrims,” is one that I tried to illustrate the need for armor when we traverse someplace we feel like we do not belong – uncharted territory. 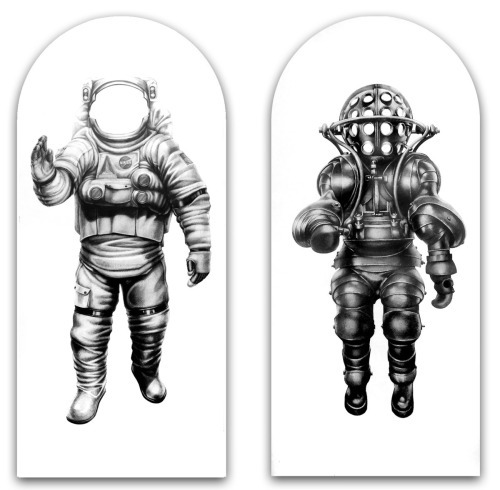 The literal depiction of this is seen with the use of an astronaut’s suit, and a nautical diving suit from 1890, placed side by side. Both designs are somewhat flawed in their ability to negate all forms of penetration. But never the less, when we go someplace new, and untouched, we armor ourselves out of fear of the unknown. And those who make it back unscathed are revered and glorified. I admire paintings that are well-drawn and drawings that are painterly. You seem to achieve a perfect middle ground between the two. Did you study painting? Do you find that people try to define your work as one thing or another? I originally started as an oil painter. I received my undergraduate degree in Painting and Drawing from the University of North Texas, and later my Masters in Fine Art from Otis College of Art and Design, with emphasis in Drawing. I also spent some time back in 2009 studying painting and art restoration in Florence, Italy. All of these experiences, I believe, helped me both technically and conceptually on how to approach my work. In terms of defining my work as one thing or another, I would say that misses the point of what most artwork is trying to achieve. Its purpose is to start a discussion with the viewer. Or even better, have the viewer start a conversation with themselves, reflect on predisposed ideas they may have, and consider an alternate point of view. Only when you have done that, does your work truly succeed.